Lynn Canyon Park, popular for its suspension bridge, is located minutes north of downtown Vancouver. Here’s how you can get here by public transportation. The journey begins at Waterfront Station in downtown Vancouver. If you are staying in the Vancouver area, you can hop on any of the three SkyTrain lines (Expo, Millennium, Canada) to reach Waterfront Station. Before I get into details about how to get to Lynn Canyon Park, I will recommend why you should purchase a DayPass for $9.75. 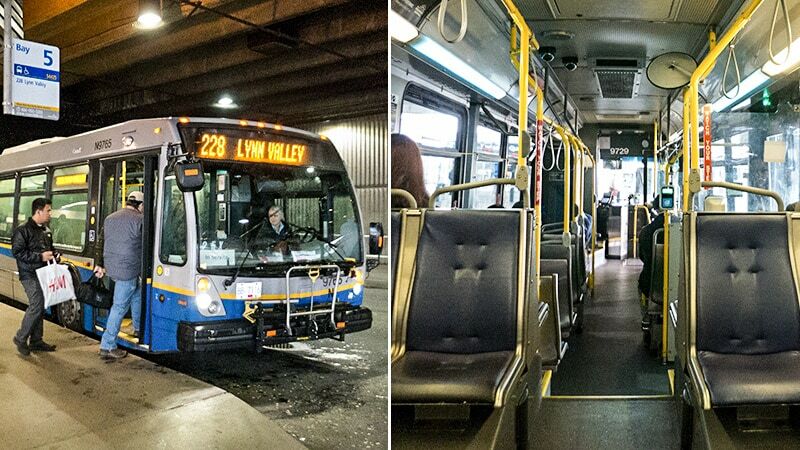 A DayPass covers all buses, SkyTrains, and the SeaBus in Vancouver. The SeaBus travels across two zones from Waterford Station to Lonsdale Quay in North Vancouver. The adult SeaBus crosses two zones at a cost of $4 a way ($8 round trip). After you exit the SeaBus, you will then need to board a bus. The adult price for the bus is $2.75 a way ($5.50 round trip). If you purchase individual SeaBus and bus tickets, the journey will cost you $13.50. 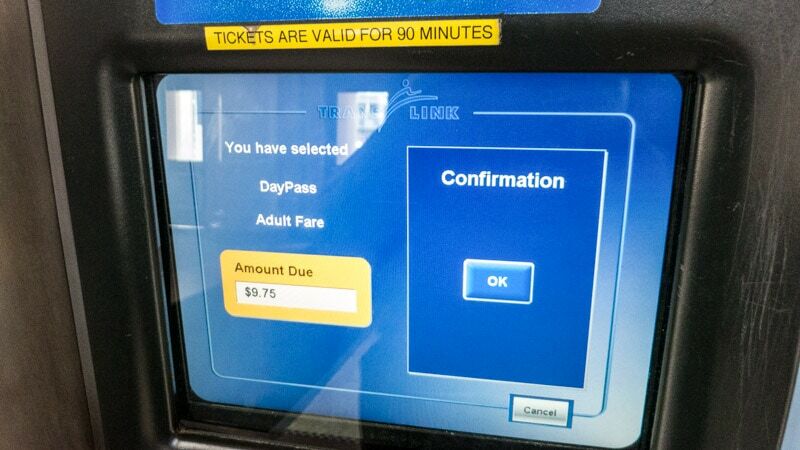 At $9.75, the DayPass will save you money. You can also use the pass for the rest of the day which will save you even more money. It’s now time to head to Waterfront Station. The beautiful red brick station is hard to miss. It is located at the terminus of Granville Street on Vancouver Harbour. Some of the services available at the Waterfront Station include the SkyTrain, West Coast Express commuter rail train, TrainBus, an assortment of bus lines, float planes, helicopters, and the SeaBus. 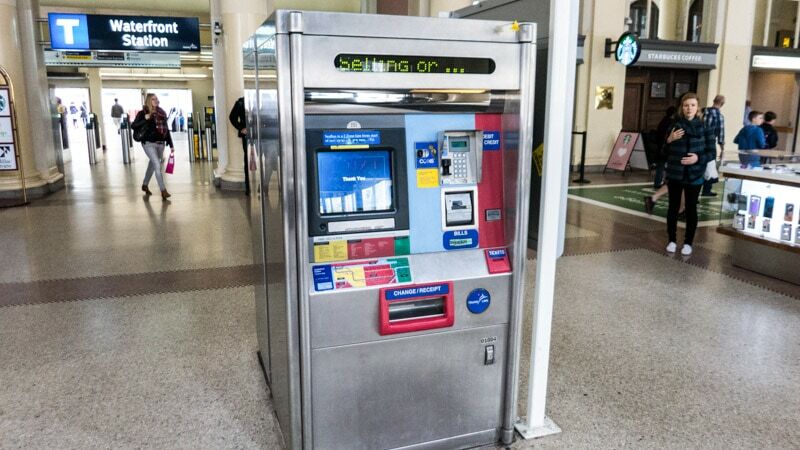 When you first walk into Waterfront Station, immediately in front of you is a self serve ticket machine where you can purchases tickets for the SeaBus. The machine accepts both credit cards and cash. It’s now time to buy your DayPass and board the SeaBus. You may also buy individual tickets here. 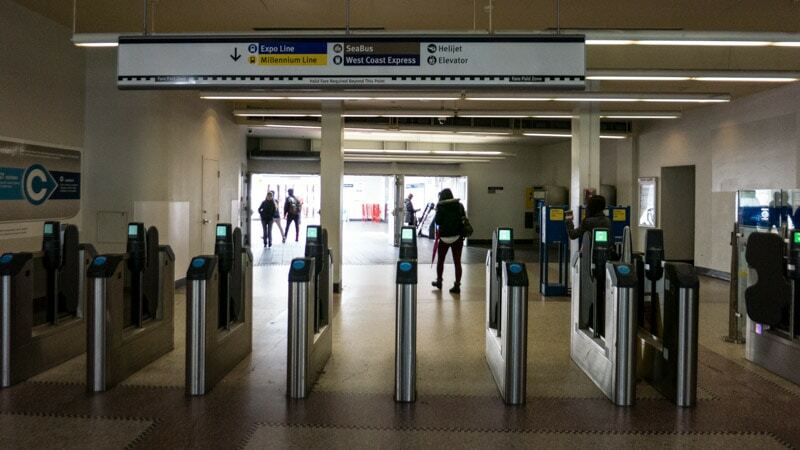 With your DayPass in hand, you are now ready to enter the gates towards the SeaBus. 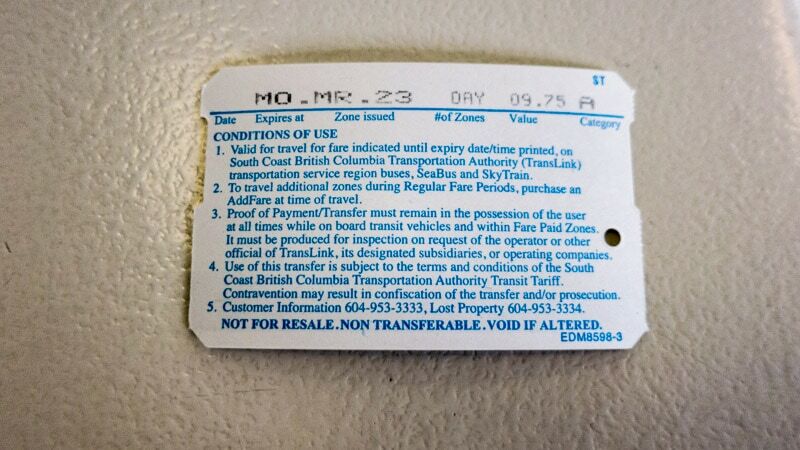 Make sure not to lose or misplace your DayPass as you may need to show it at various points along the journey. In front of you, just beyond the ticket machine, are the gates for all the lines at Waterfront Station. Past these gates you can access the Expo Line, Millennium Line, West Coast Express, Helijet, and the SeaBus. Continue through the gates and follow the signs towards the SeaBus towards Lonsdale Quay/North Vancouver. 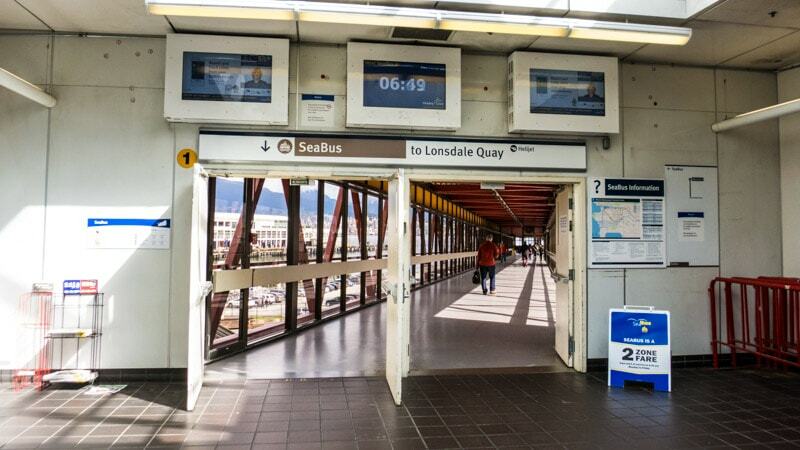 Once you pass through the gates of Waterfront Station, follow the signs towards the SeaBus. If you see SeaBus towards Lonsdale Quay, then you are going in the right direction. Above the doors for the SeaBus is a television with a timer. This clock counts down the time until the next SeaBus departure. Continue down the walkway and down the escalators to reach the SeaBus loading area. You purchased your pass, you entered through the gates, you made it to the loading area of the SeaBus. Now all you have to do is wait for the next ferry to arrive and walk on. The SeaBus is fully enclosed. There are no outdoor seats. Seats are first come first serve. You should have no trouble finding a seat though. If you can, try to pick a seat near a window for great views of downtown Vancouver, North Vancouver, and the harbour. Welcome to Lonsdale Quay on the north shore of Vancouver. After exiting the SeaBus, you will pass through the gates of the SeaBus Lonsdale Terminal. After passing through the gates, walk across the street to Bay 5 for Bus 228. The bus departs every 30 minutes. Board the bus, show your ticket, and take a seat. 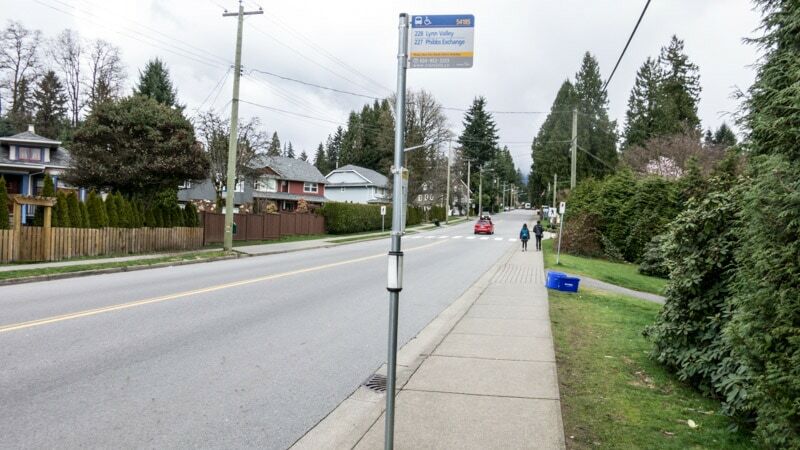 Take Bus 228 to stop number 54185 for Lynn Valley Rd at Peters Rd. The journey takes about 30 minutes. After you exit the bus, continue north on foot (the same way the bus continues) for about 75 meters to reach Peters Rd. At Peters Rd., make a right. You can see the general location of Peters Rd. in the photo above where the couple is standing on right. Peters Rd. is located where you see the crosswalk on the ground. When you reach Peters Rd, you will sign a sign directing you to the right for Lynn Canyon Park. Continue on Peters Rd for one kilometer (0.6 miles). Welcome to Lynn Canyon Park. Just past the suspension bridge you will find many wonderful hiking trails that make their way through beautiful green forests. When you are ready to leave and get back to downtown Vancouver, follow the same steps above but in the reverse order. Hey – just wanted to say how incredibly useful your guide on getting to Lynn is. I’m visiting Vancouver for the first time in a few weeks time and will be relying on public transport – your step by step approach above (particularly with the photos) on getting to Lynn Canyon Park was extremely helpful – google directions were quite confusing! Many thanks for your time uploading this. Just a note of appreciation for such excellent n detailed info.